Sam (LL Cool J) is on the job as he surveys a lobby. DSS Agent Brian Bush (Drew Waters) talks shop with Sam and Callen (Chris O'Donnell). It's a team effort as Deeks (Eric Christian Olsen), Kensi (Daniela Ruah) and Sam work together with DSS Agent Brian Bush. What could the group be talking about? No one messes with Kensi. Sam and Callen are all business when it comes to an assignment. What's putting the team in a defensive position? These colleagues are the picture of being calm, cool, and collected in dangerous situations. What's brought Callen and Joelle Taylor (Elizabeth Gobush) back together? Could she be lending her expertise for the team's case? The team is on a new mission in the October 14 episode of CBS' NCIS: Los Angeles. 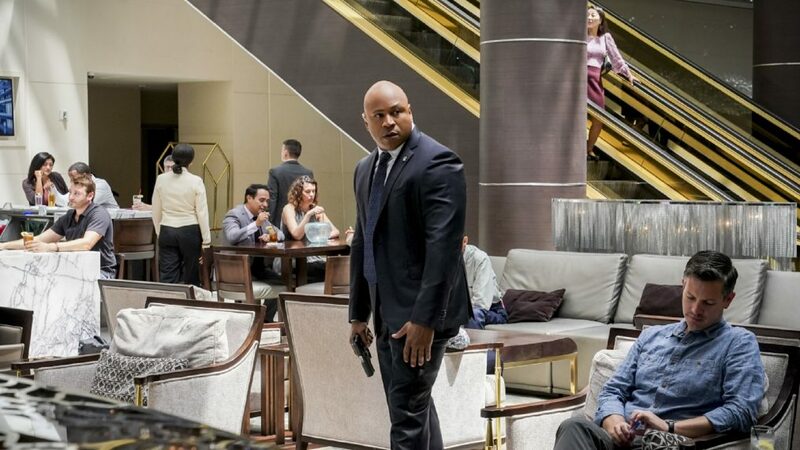 After last week's tactical suit storyline, Callen (Chris O'Donnell), Sam (LL Cool J), Kensi (Daniela Ruah), and Deeks (Eric Christian Olsen) are tasked with a new assignment — protect a prince. What kind of shenanigans will occur when the Deputy Crown Prince Kamal (Ritesh Rajan) arrives in Los Angeles? Fans will have to find out when the episode airs, but know that an assassin stirs things up when he targets the prince's decoy upon arrival. Above, click through the photos from next week's episode, and don't forget to tune in!